Rubber animal toys are being recalled by BSN Sports after it was found that the orange and yellow paint used to color the toys contained too much lead. The toys, which came shaped like penguins, chickens, pigs, cows and more, were primarily used for physical education tossing games, according to the company. Tens of thousands of rubber critter toys in the shapes of animals are being recalled for excessive lead levels in their orange and yellow paint. BSN Sports sold the 31,200 recalled units nationally through catalogues and online at Amazon.com, Athleticconnection.com, Bsnsports.com, Esportsonline.com and Usgames.com from February 2017 to June 2018, according to a recall notice posted Wednesday by the U.S. Consumer Product Safety Commission. 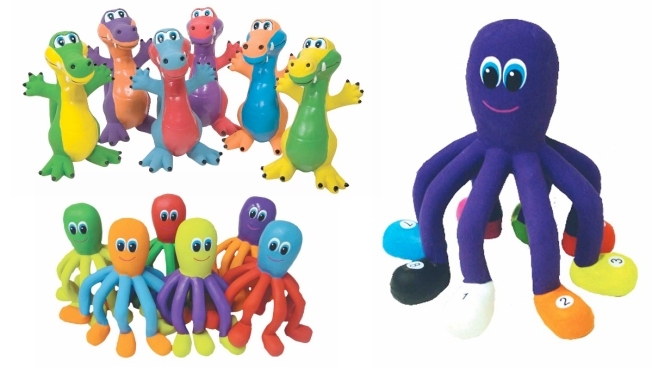 The toys, which the notice says are "primarily used to play physical education tossing games," are shaped like an octopus, alligator, chicken, frog, pig, penguin or cow. "Consumers should immediately take the recalled rubber critter toys away from children," the recall notice said. Lead is especially dangerous to children because their bodies absorb the toxic element more than adults' bodies do, and a child's nervous system is also more sensitive to lead's effects, according to the Environmental Protection Agency. The toys, which were made in China and imported and distributed by BSN Sports, sold for about $10 for an individual rubber critter or up to $145 for a set, according to recallrt.com/rubbercritters. Sets ranged from two to 24 critters. BSN Sports said it was contacting all known purchasers directly but those who bought the critters can also request a merchandise credit by calling 1-888-847-8816 between 7 a.m. and 6 p.m. CT on weekdays. Those who want refunds can also register at recallrtr.com/rubbercritters.